Hello to all you delightful creatures who seek a soul-satisfying segment from my life! Well....at least I hope your soul is satisfied after reading my post! Some of you may not be familiar with the story behind my blog title and Etsy shop name, or how my name sketches and initial pendants came into being. So here is my story! Quite a number of years ago, my sister, Cindy, requested original art for her birthday celebration. We siblings are all artists in one way or another, as well as our mom (I will feature her artwork at a later date). I don't remember what other members of the family gave her, but I came up with the idea of sketching the initial "C" and adding a rose. 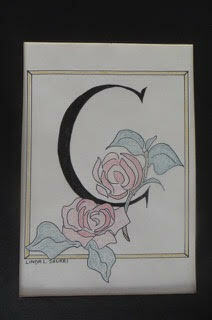 I used black ink and colored pencils to create this first "name sketch" or "letter sketch." I have always loved lettering and beautiful fonts, even though I was never a calligrapher and still can't call myself that, as I don't use a particular font for writing. I tried practicing to be a true calligrapher, but it takes a lot of time to perfect and I gave up trying! (I have a sister-in-law - Bonnie - that does beautiful calligraphy! Hi Bonnie!! 😁) I do use a calligraphy pen, but my style is my own handwriting and that is what you see in my poetry illustrations (here). It serves my purpose right now! 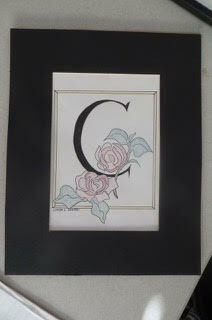 And here is Cindy's C! - many years ago - and it's still in her possession. (If she had told me it was gone, I would have cried, but forgiven her - possibly! 😉) I had her take photos of it for this post. This was the beginning of many more name sketches! When I create a name sketch, the lettering is based on the Versals font and then I embellish it in my own fashion. Since the letters are much larger than a person's handwriting, I first sketch them in pencil, making sure they are spaced correctly and centered on the paper. A stash of bird and flower magazines are thumbed through for the perfect bird or birds and flowers to embellish the name. I enjoy positioning the birds like they were standing or sitting on the individual letters. Birth or wedding dates are sometimes added depending on who is receiving this original illustration. Here is my latest creation - a custom order from a lady in North Carolina. This was a gift for her friend who was expecting a baby girl in June. I asked her if she was sure about the name and the gender. She replied: "We're good!!" Though it wouldn't have mattered to me anyway because she had already paid for it! The mother-to-be's favorite flower was the violet and of course, that was what she was naming her baby. Plus, her maiden name was Peacock. An obvious choice, then, wasn't it, to add that bird to the name sketch? This was my very first peacock I had drawn/painted. After the pencil sketch is complete, I ink in all the lettering, and outline everything else in ink. My first name sketches were done in ink and colored pencil. The last few years I've started painting them with watercolors and sometimes use colored pencils over the watercolors, as I did in the one you see here. My original Etsy shop was Fredericton Station Studio, after the name of our street. I offered name sketches, house portraits, Celtic knot jewelry, and initial pendants. 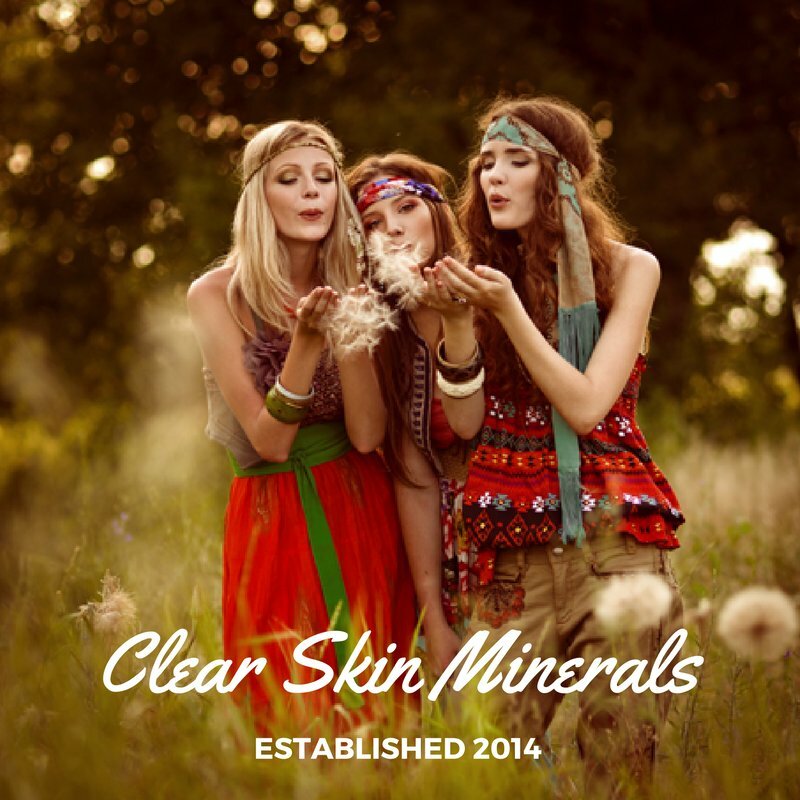 A year later, I changed my shop name to Tintenfleck Studio. Why? A shorter name and something unique! I wanted my shop name to reflect what I created, to some degree. Delving into a foreign language was the thing and after much deliberation and mind wracking creativity, the word "ink" was translated into German - to reflect my German background. Tintenfleck means "spot of ink" in German (see my blog heading). I consulted my cousin, Martina, who lives in Germany, what she thought. She said that "tintenfleck" technically means a messy spot of ink, whereas "tintenkleck" is a nicer term for a spot of ink. I decided to choose "fleck" because it's an English word, since I only operate in English, you know, and people know what "fleck" means. And "tint" is an English word, as well. And you know what that means, too. And there you have it! A messy spot of ink!! Then....because I wanted my shop name to showcase a special font, it took me hours to find just the right one to use. Cardinal is its name and it bears a close resemblance on the Versals font, don't you think? To make my original initial pendants, a special clear glaze is spread on the underside of the glass cabochons. See photo below. Then I sprinkle champagne glitter on the glaze, flip over the cabochon and place it on top of the card stock copy - on top of the illustrated letter. When I make sure the glass is sitting correctly on the letter, I let it dry for a few hours. The initial "L" in this photo didn't come out exactly right - it's a little crooked, so at some point I will soak it in water to remove the card from the glass and make a new one. That is why my pendants are not to come in contact with water because they will be ruined. Remember that, when you purchase one from my shop here! No refunds on the boo-boos you create yourself! Next, I stick clear packing tape on the underside of the card stock. That keeps the glaze from reacting with the metal pendant tray when it's glued together with the glass. If I don't use the tape, the card stock changes color, ruins the image, and I have to re-do the pendant from scratch. I learned the hard way! The other pendants I make - the floral and horse illustration pendants in my Etsy shop (here) - are not totally my creation. The illustrations were purchased from another Etsy shop. I print them out onto card stock and create the necklaces in the same manner as my initial pendants. Everyone has a family member or friend who would love a unique and original gift for their birthday or wedding - a bride-to-be or a baby's birth celebration. You won't find my name sketches anywhere else but here. Hand created, not computer created. They have been well received by the recipients! Until next time, when I bring you yet another tale of talent, a story of suspense, a snippet of life here, or a snippet of life there, Psalm 49:3 says: My mouth shall speak of wisdom, and the meditation of my heart shall be of understanding. Thanks so much, Lynda! Yes, I got your email and will reply later to your last message. Have a great week! Hi Linda. I found your blog from The Enchanting Rose site. I've enjoyed reading all your posts. It was so funny to me that your mother named her girls Linda & Cindy because so did mine! There are lots of Lindas out there - but not that many Linda's with sister's named Cindy. (Although I do have a friend at work named Cindy, with a sister named Linda.) It was fun to read about your blog name - your craft and meet you. I checked out your etsy shop a little bit and you have some beautiful items there.